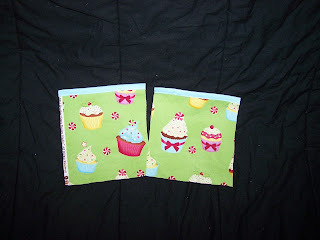 My friend and I were in Hobby Lobby the other day and found some adorable holiday cupcake fabric. We wanted (needed) to have it, but had no idea what to make with it at first. 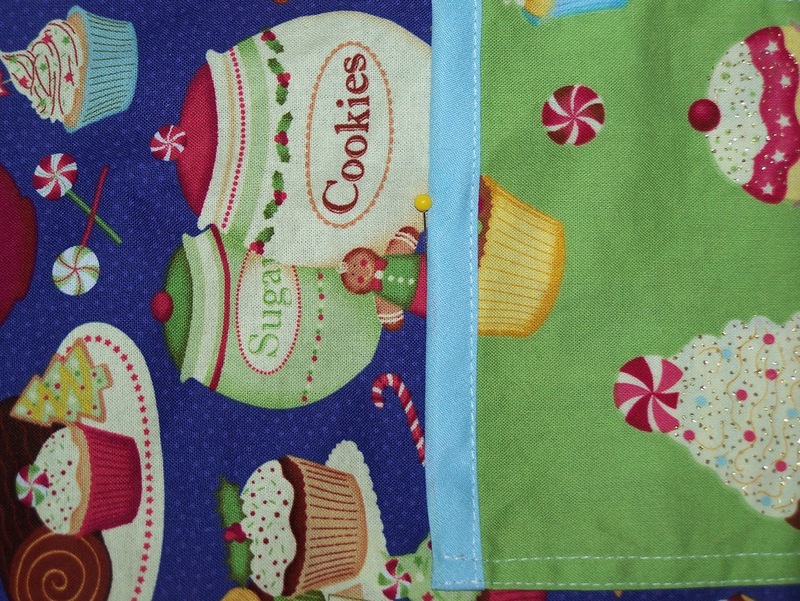 We finally decided on making some simple aprons to do our holiday baking in. 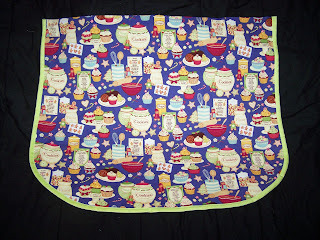 With Christmas coming up and all the projects I have going for that, I could use a quick and easy project! 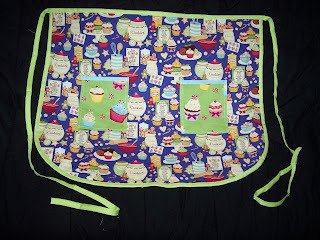 Here's a super cute--and super quick--apron you can whip together in about 30 minutes. 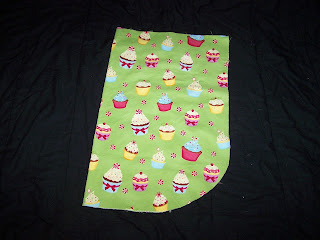 Of course, this time will vary depending on your sewing skills, but seriously, it took me longer to put together this blog post than it did to make one of these aprons. You will need roughly 2/3 of a yard of fabric (prewashed) and 2 packages of extra-wide, double-fold seam binding in a coordinating color. Make sure it's double-fold! 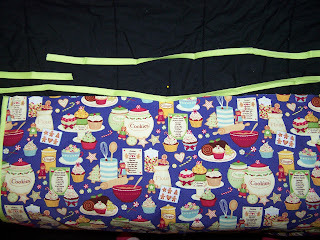 Cut the fabric so that it is about 22" long. (It doesn't need to be exact--after all, it's an apron). 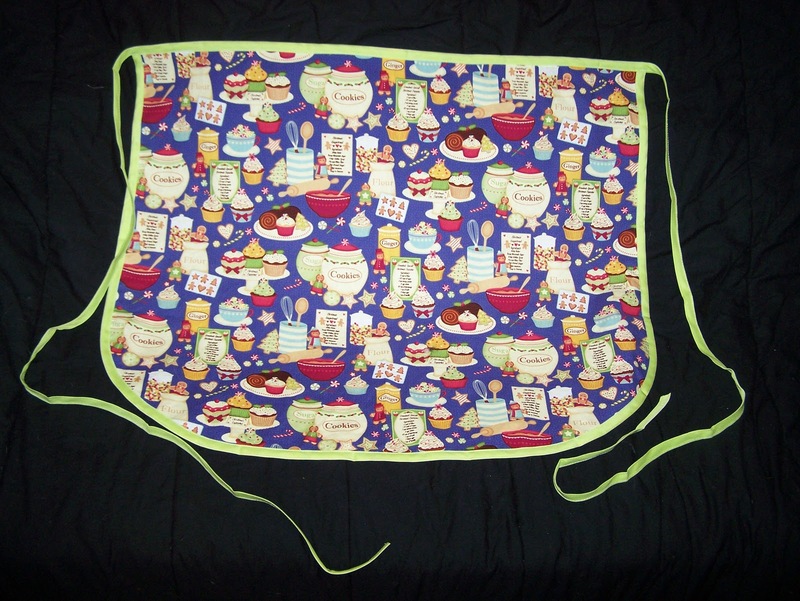 Next, to figure out how wide you want your apron, simply hold it up and wrap it around you. I'm an average-sized woman, and I made mine about 26 1/2" wide. I didn't measure it exactly; I just held it up to myself, saw about how much I needed to cut off, and chopped off the sides. The fit isn't really important, which is what makes this project nice. Next, round off the bottom two corners. I simply folded my fabric in half and cut both corners at the same time. 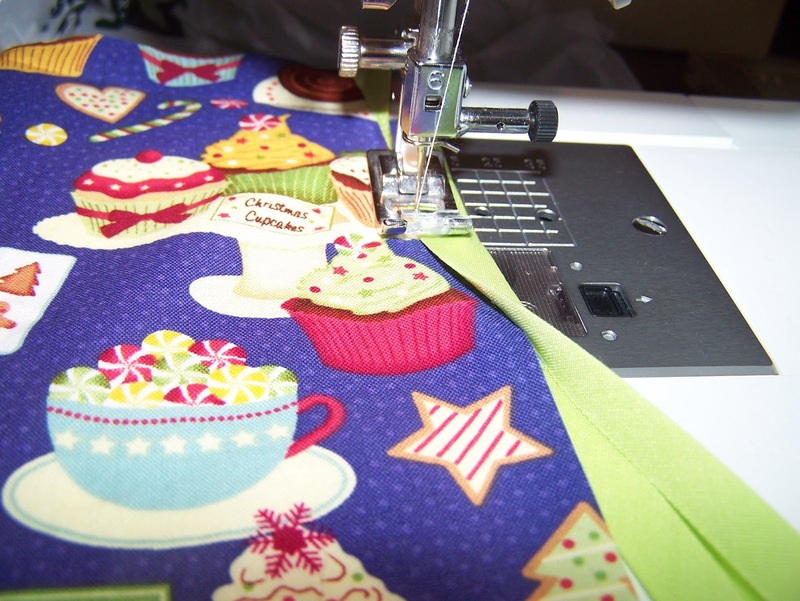 Now you're ready to start sewing--already! I told you it was quick! 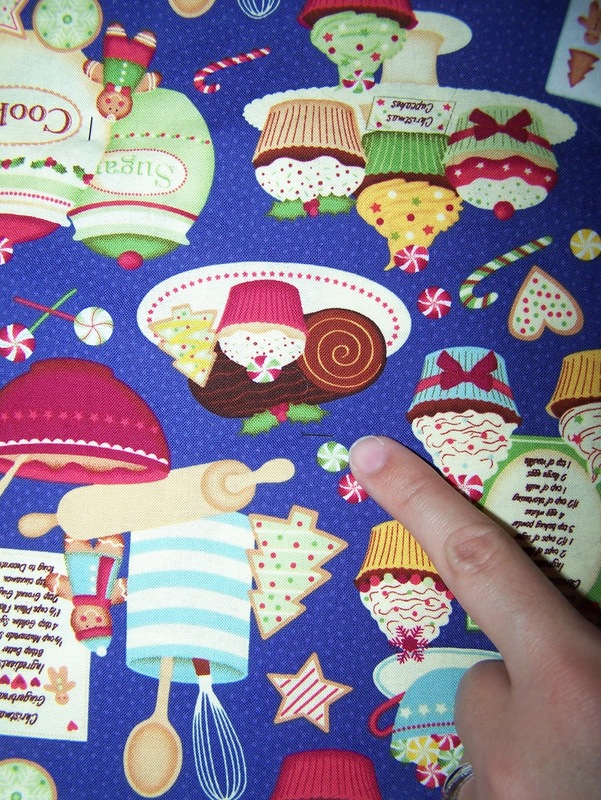 You're going to put seam binding around the bottom and two side edges all at once. Starting at one of the top corners, sandwich your apron fabric between the layers of seam binding, and then stitch as close as possible to the edge of the seam binding. Stitch all the way down the side, around the rounded corner, across the bottom, around the other rounded corner, and up the other side to the top. 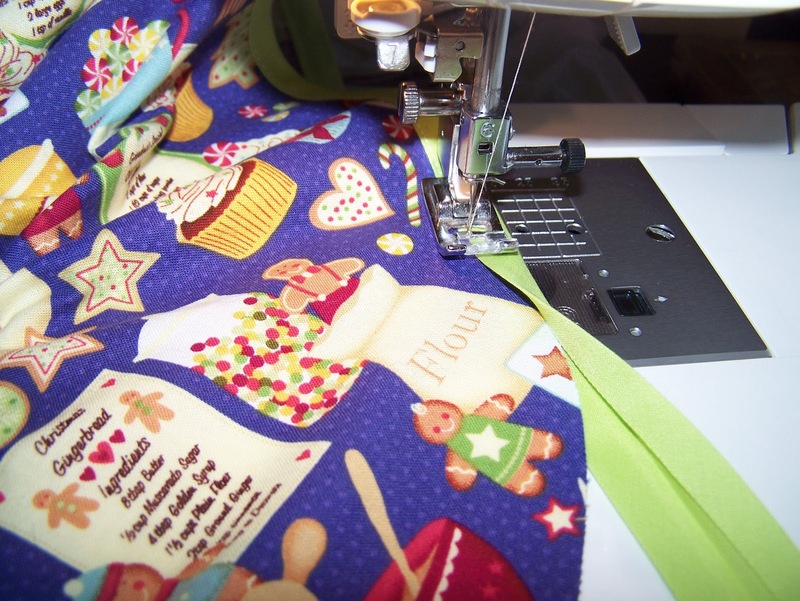 While none of this sewing is truly difficult, the rounded corners will provide the most difficulty to someone who is new to sewing. I recommend working around the corners a little at a time; don't try to pin the whole binding in place beforehand. Just stitch slowly and line up the next inch or so in front of the presser foot, stitch it, stop, and repeat. When I do this I just leave the entire length of binding hanging off my project and cut it off when I'm finished sewing that part. 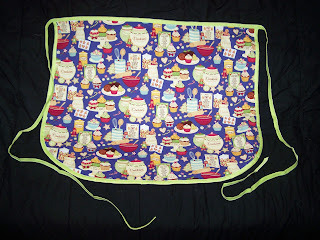 Next, we're going to finish the top and add the apron ties, all at once. For this part, open up your second package of seam binding. Yes, you probably have some left from the step above, but we'll get to that later. This step requires a whole package. 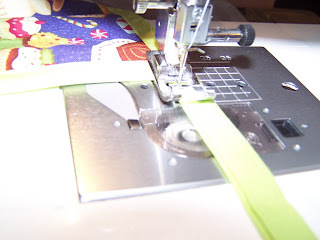 Unwind the binding and fold it in half, marking the halfway point with a pin. 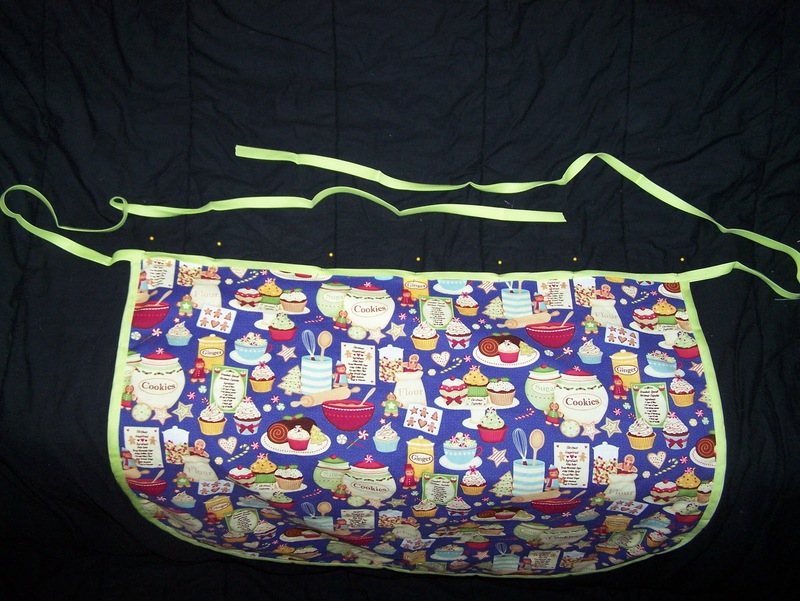 Line this pin up with the halfway point at the top of your apron (just fold the apron in half, as well, to quickly find the center). 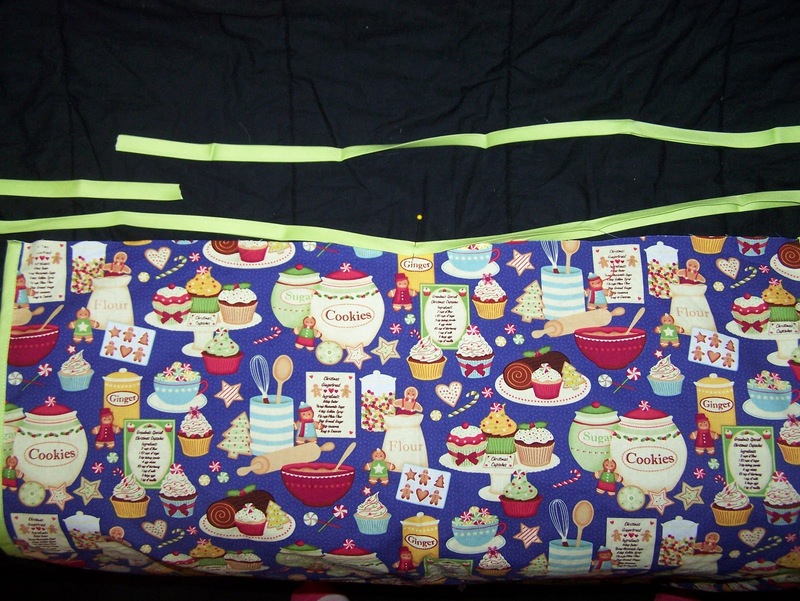 Now for this step, I do pin the binding across the top of the apron, sandwiching the fabric between the two layers, because we are working with a straight edge and it's easier. I also do this to ensure that nothing shifts and my apron strings stay about the same length. 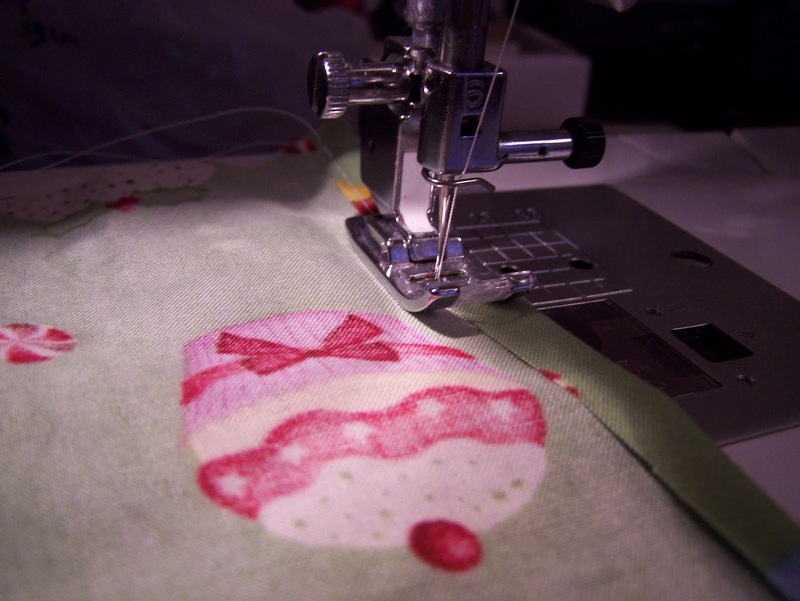 Starting at one edge of the apron, stitch across the top of the apron. When you reach the edge of the apron, keep stitching to close the open edge of the binding all the way to the end of the apron string. When you reach the edge of the string, cut the threads, and then stitch the second apron string closed the same way. If you choose, you could start at one end of the apron string and stitch across the string, the apron, and the second string in one step. I just personally find it easier to start on the body of the project. 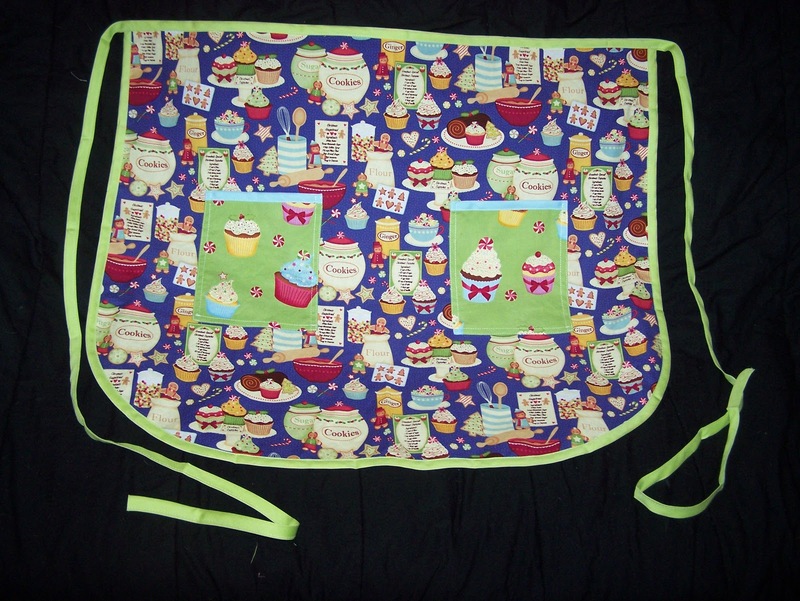 You now have an apron with finished edges and ties! 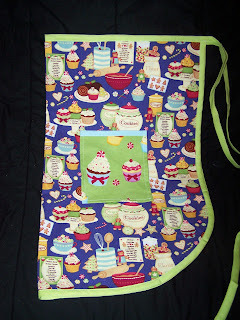 If you want, you can leave the apron like this and go start your baking right away. If, however, you want to add pockets, here's what to do. Cut two rectangles from a coordinating fabric (or the same fabric, whatever). Again, there's really no need to measure these. Just figure out a size that works for you and cut them both the same. 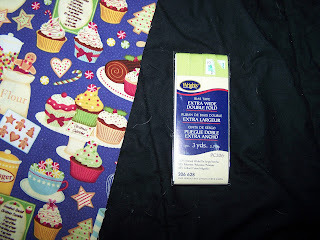 Remember that leftover seam binding from the beginning? Use that to stitch across the top of the pockets--or use a different color, like I decided to do. Next, fold under the remaining 3 sides about 1/4" each and stitch as close to the raw edge as you can. 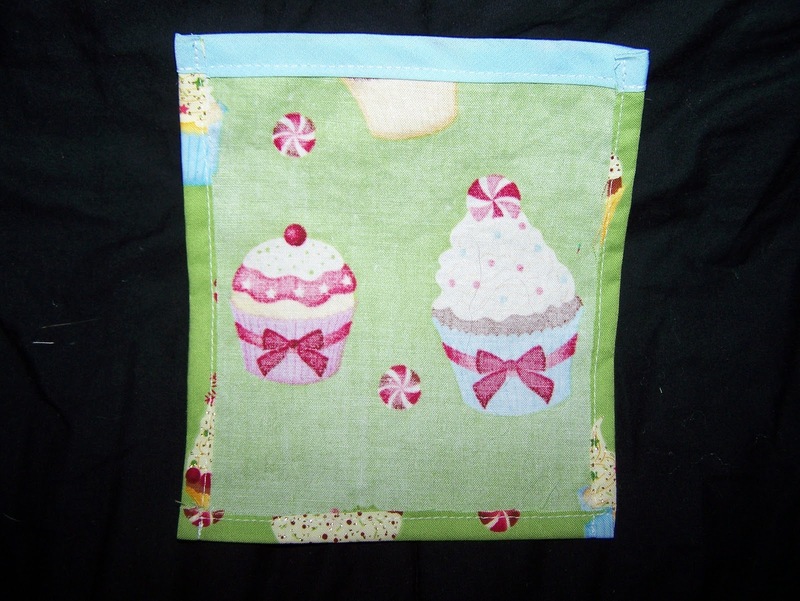 It helps if you press the sides down before sewing. 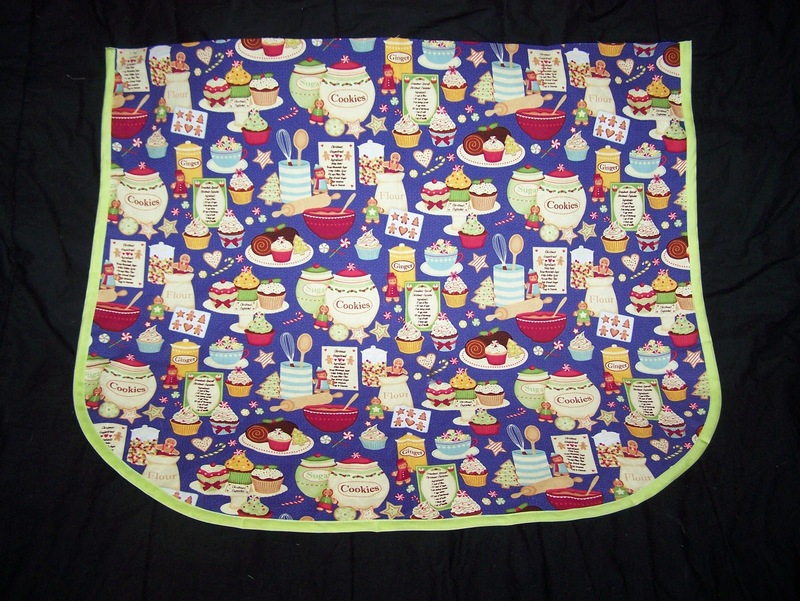 Now it's time to pin the pocket onto your apron. 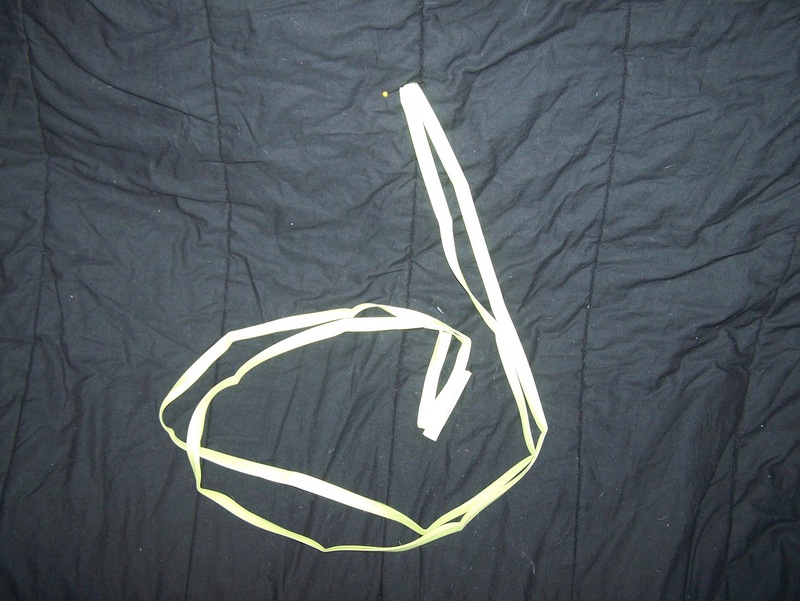 I cheated and didn't really measure this, either. After all, the whole point of this project was to be quick and easy. 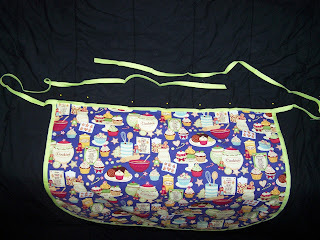 Fold the apron in half and place one pocket where you want it, then pin it on. Next, to make sure your other pocket is in the same place on the other side, I'll show you a little trick I use. I placed 4 pins around the edges of this pocket, catching both layers of the apron. I put one pin parallel to each side, just exactly on the edge of the pocket. You can just see the pin head in this picture, but I hope you get the idea. Line up your second pocket in the middle of these pin marks, and ta-da! Your second pocket is exactly symmetrical to your first pocket. Pin it in place and then remove the 4 pins going through both layers. 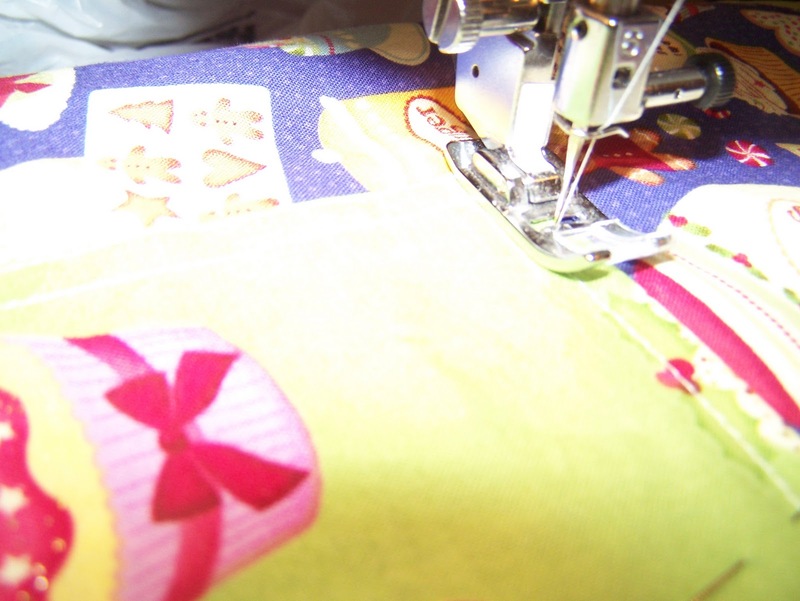 Stitch the sides and bottom edges of each pocket as close to the edge as possible. This combined with the stitching you did on the pocket a few minutes ago will give you a nice double row of stitches. And now, you're done! Pat yourself on the back for actually finishing a project this Christmas season!